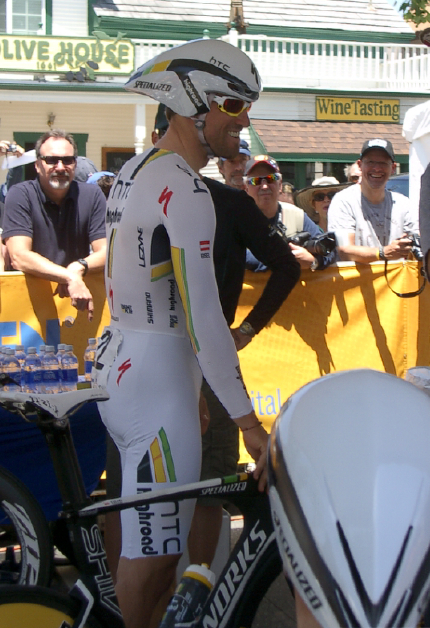 as Eisel approached the start gate just ahead of Nuyens at the Individual Time Trial of Stage 6 Amgen Tour of California today in Solvang, California. 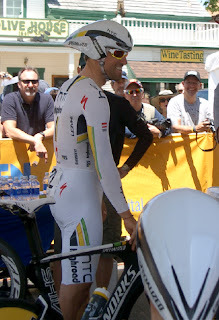 Bernhard Eisel (HTC-Highroad) gave a quick playful smile in response to Nuyens (Saxo-Bank), and the crowd of fans joined him in a laugh. What a great day, I have hundreds of pictures from today that I will be sorting through and posting very soon. It was a FUN day at the Tour!